Rev. Fr. Laby George is from Niranam in Kerala, India. 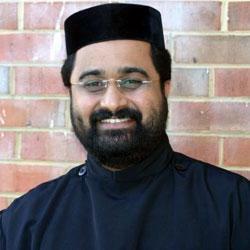 He was ordained as a priest on June 15, 1999 and since then has served as a priest in India, in the states of Kerala, Goa, Gujarat, and Maharastra. Fr. Laby also served as the vice president of MGOCSM for the Bombay Diocese. Rev. Fr. Laby completed his Bachelor of Divinity degree from India and also holds undergraduate degrees in Physics (B.Sc) and Education (B. Ed.). Fr. Laby comes from a family of priests. His father is also a priest of the orthodox church (Rev. Fr. George Panackamattom) and mother (Annie George) is a retired school teacher. Achen is married to Merin and they are blessed with two children daughter Lydia and son Georgy.